This family home, with its sultry blue-grey exterior, is a wonderful example of a classic and modern design. 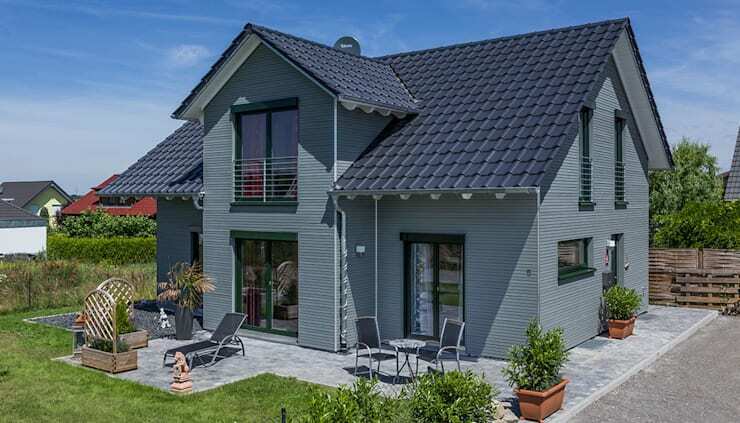 Designed by professionals KitzlingerHaus GMBH & CO.KG, this gable roof structure with its wooden facade creates a very homely and inviting look and feel. As we explore the interiors, we will also see how it is been turned into a perfect space for a family – it's social and open. Under the motto of: Take good care and make it better, this home was developed as a cozy space for a family of five. It was built according to their needs and wants too, ensuring that it was functional and practical. 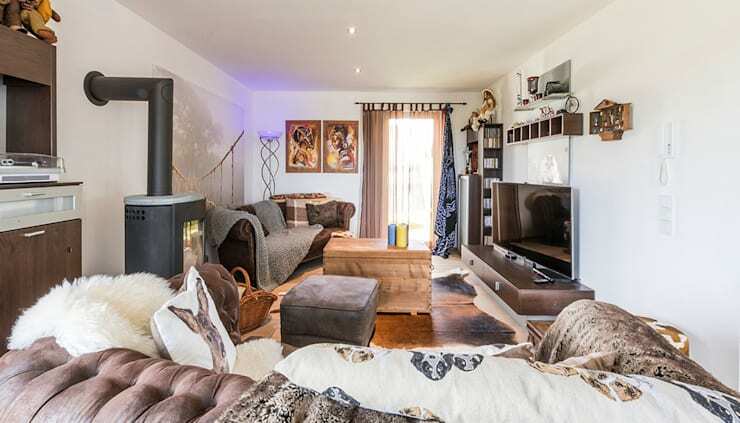 Approximately 1,800 square meters, this is a home that you are going to want to explore today! Have you ever seen such an appealing home? 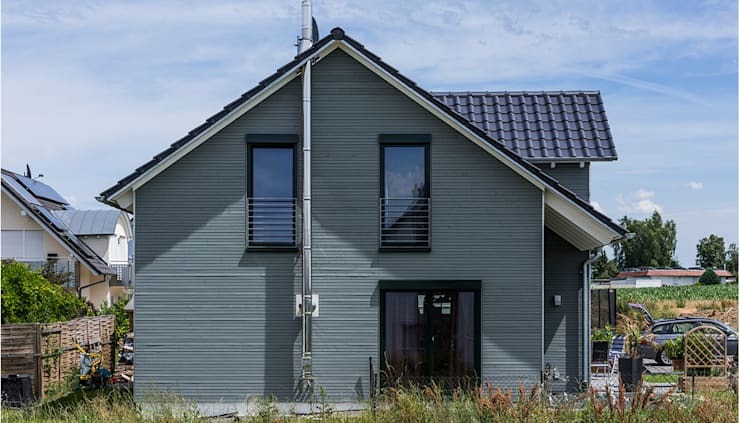 The blue-grey facade creates a very warm and inviting look and feel right from the get go, while the traditional gable roof makes for a classic and stylish look and feel. The interior spaces of the home spill out onto a large garden and terrace area complete with outdoor furniture. Couldn't you imagine entertaining family or friends outside or relaxing with a good book in the sunshine? The beautifully manicured lawn and carefully trimmed trees enhance the exterior facade. From this angle, we can see how the large glass windows and doors allow for a wonderful interaction between interior and exterior spaces in this home. It also allows natural light to flow through the home. The Juliet balconies on the top floor allow the family to enjoy the beautiful surrounds, without worrying about safety or security. We also get a sense of the different volumes and shapes used throughout the architectural structure. As we enter the home, we come across a gorgeous and detailed living room. With neutral colours and earthy materials, including wooden floors, tan sofas and thick, sheepskin blankets, this is a room you'd never want to leave! The designers have added charm and personality throughout in the form of decor items, accessories, artwork and cushions. Even the textiles enhance the warmth and soul in the environment. Do you see how much of a role natural light plays, working in harmony with the soft colour palette and warm, earthy tones? In the dining room, we can see how colour has been introduced in the interior space, subtly but very effectively. Bright pink curtains decorate the windows while a runner on the table brings the pink theme alive. A wonderful tip for any room is to add a fresh vase of flowers, which brings a natural form of decor and beauty to the room. A pot plant or small tree works too! The dining room flows into the modern kitchen area, creating a wonderful and easy interaction between the two spaces. This makes entertaining a breeze! Don't you love the kitchen island, which provides extra storage space to the area as well as an extra surface for cooking or preparing food? The kid's bedroom is always a chance to have a little bit of fun and get creative. In this home, we can see that the designers have risen to the challenge. All of the colours of the rainbow have been introduced throughout the space, creating a room that sure to inspire. 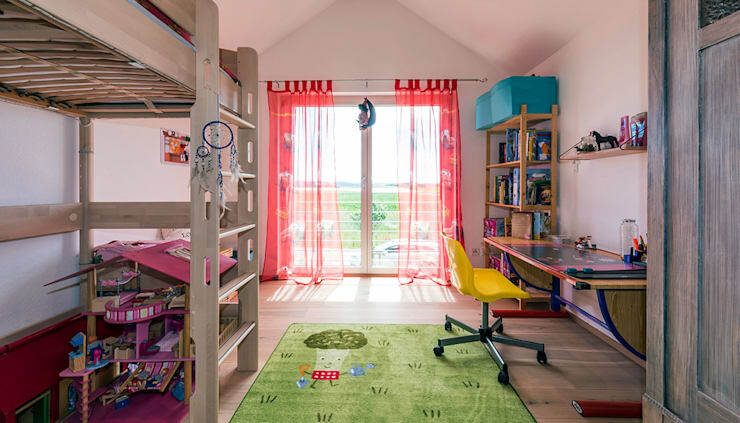 Kids can let their imaginations run wild in this bright and homely space. You'll also notice that storage plays a role throughout this room, keeping toys, books, stationery and other items neatly stored away. Shelves are a must for any kid's bedroom, ensuring that the room remains tidy and neat after play time! 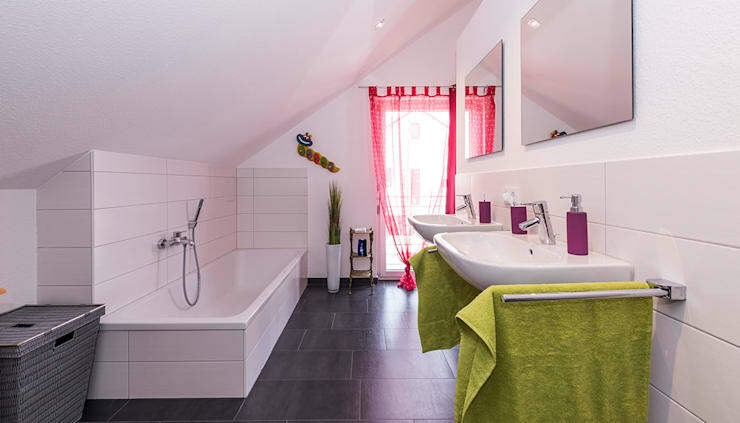 This bathroom features the same colour palette that we saw in the kid's bedroom, making it very child-friendly. Bath time has never been so fun. However, you'll notice that the foundation of this space is very neutral with white walls and features and grey floor tiles. 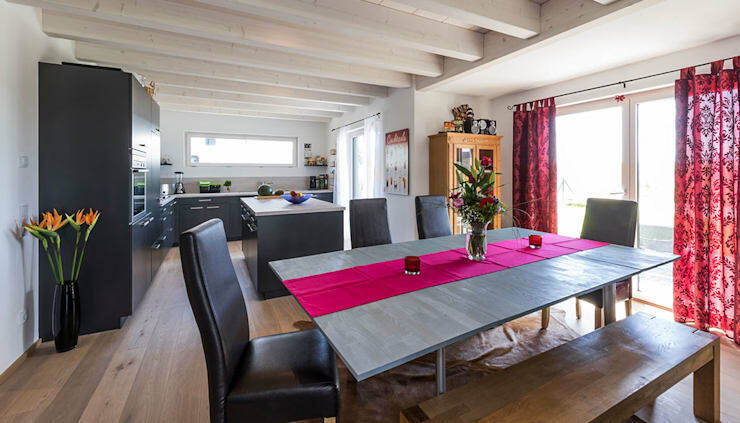 This means that if the family want to change the look and feel of this space, they simply have to swap out the textiles. 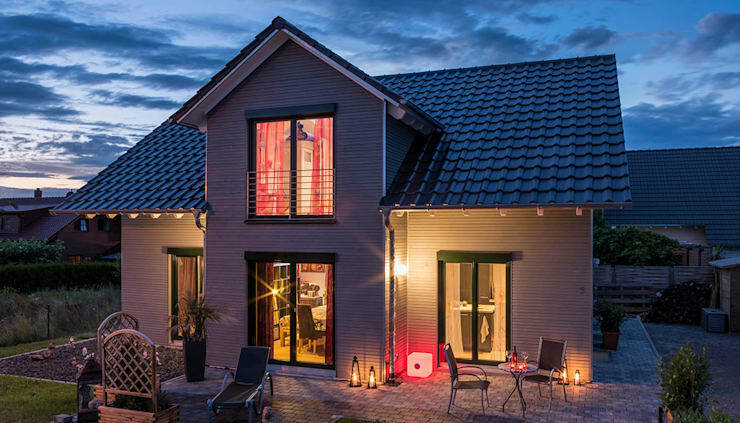 Finally, we get a glimpse of this beautiful family home in the evening. The designers have used lights to enhance the details and design of the exterior facade. This not only enhances the aesthetics of the space but it makes this place a very safe and friendly environment in the evening.